A week ago today, we returned from one of the most beautiful countries on earth – Sri Lanka. When we first told people where we were going, we were met with mostly confused responses – “Isn’t Sri Lanka just a rubbish version of India?”, “Are you going for the beaches?”, “Is Sri Lanka still really dangerous?” “Is there even anything to do there?” No, no, no and YES! Sri Lanka is a misunderstood country thanks to its pretty turbulent past and recent civil war. 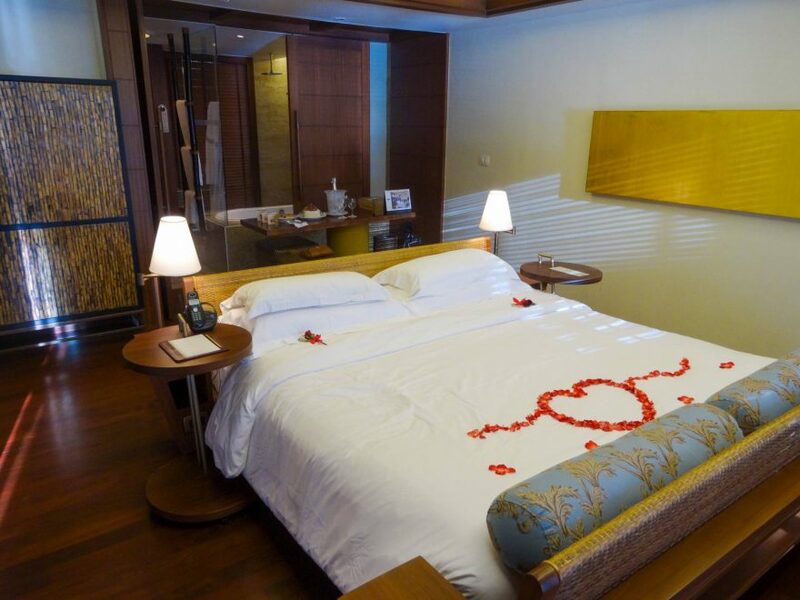 But now that the troubles are over, it is still a relatively untouched paradise that feels like the majority of tourists in the country are its own residents. 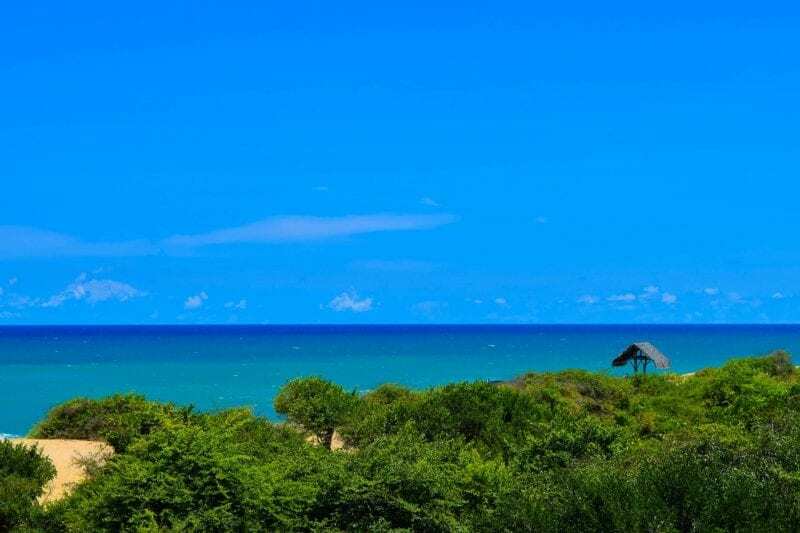 We were attracted by its stunning countryside, tropical climate and friendly people, but mostly because of its endless list of things to see and do. Said to have been home to a King who murdered his father to take the throne, Sigiriya is an ancient fortress at the top of a 200m high rock. Thousands of visitors scale the 1200 steps to the top every day and, despite the terrifying climb, I was determined to be one of them. There is a rather flimsy looking staircase winding its way around the huge rock, but the Sri Lankans leap up without a care in the world. Our guide even completed the climb in flip flops! Desperately clinging to Tim in front of me, I slowly reached the top and can assure you that every step is worth the effort. Ruins of the King’s palace are still visible on the rock’s level top, but the real reward for your efforts are the views. You can see for miles in every direction, and Sri Lanka is a treat for the eyes no matter where you look. 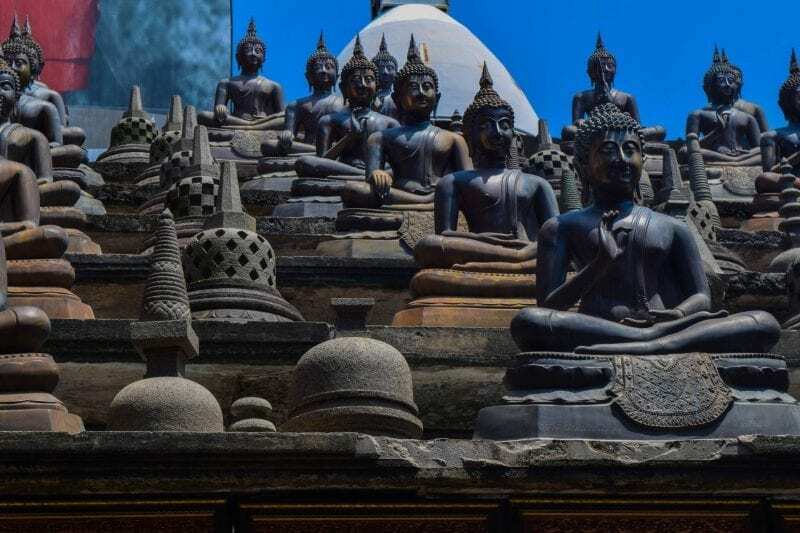 Buddhism is the most popular religion in Sri Lanka, with Buddha images and temples on every corner. 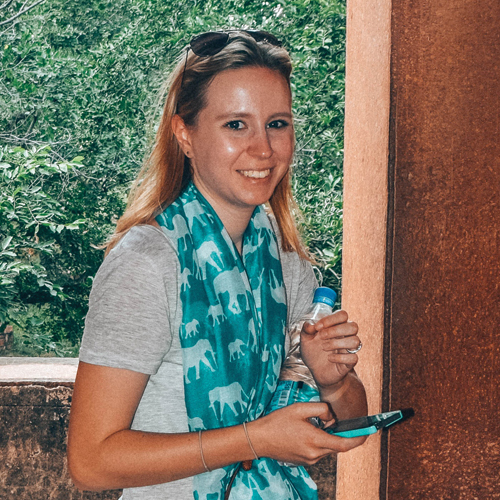 Our favourites of the bunch were at Polonnaruwa and Dambulla in the centre of the island. 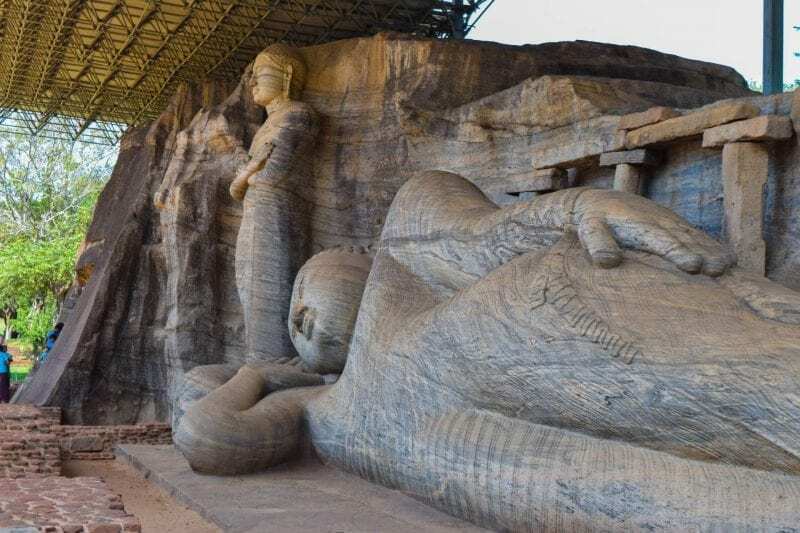 Polonnaruwa is an ancient royal city that has now become a UNESCO World Heritage Site thanks to the ruins of a palace, temples and other Buddhist relics. We had a guided tour of the site, including the Buddha images impressively carved out of a single rock face at Gal Vihara. The whole site is covered with monkeys – both grey langurs and macaques live in the area, and we even saw a fight between the two tribes as they tried to defend their land from each other. 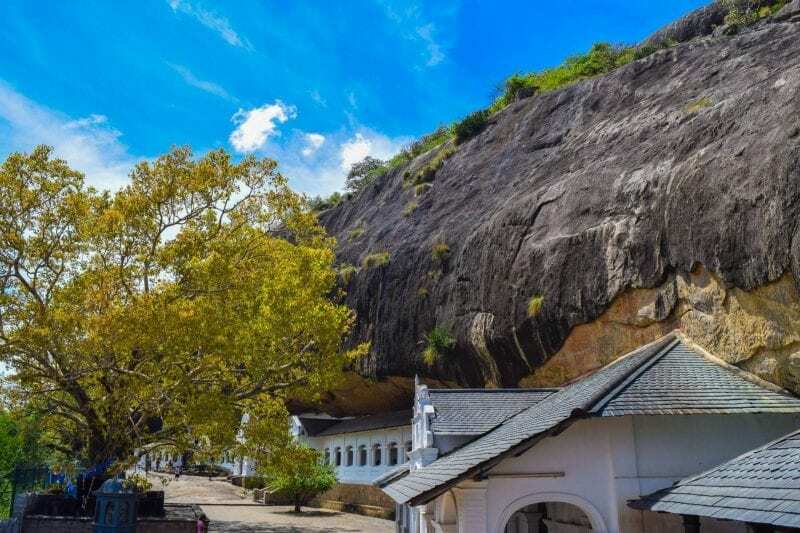 The Dambulla rock temple is another UNESCO World Heritage Site, consisting of 5 caves filled with Buddha images, figurines and paintings of historical scenes. Being a religious site, we needed to take our shoes off to walk across the rock surface that had been baking in the sun. We were all hopping about madly as it was so hot! 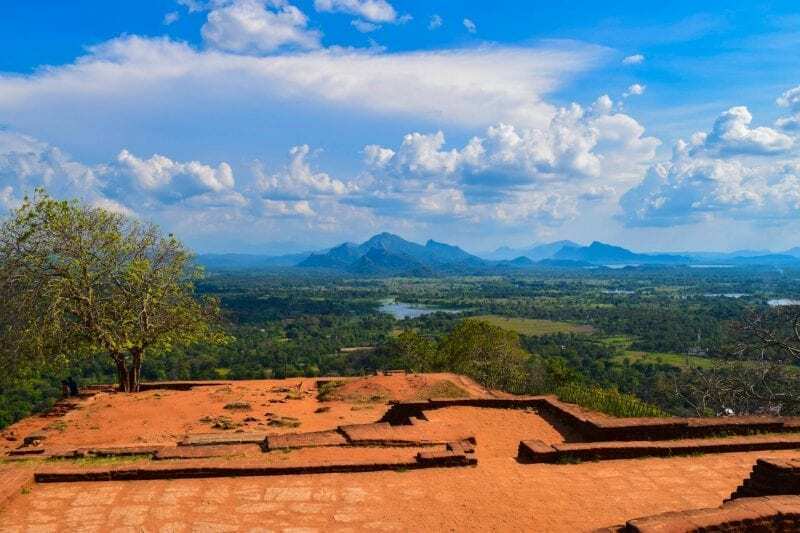 For me, the most spectacular part of the temple was the panoramic view from the top where we could see as far as Sigiriya. 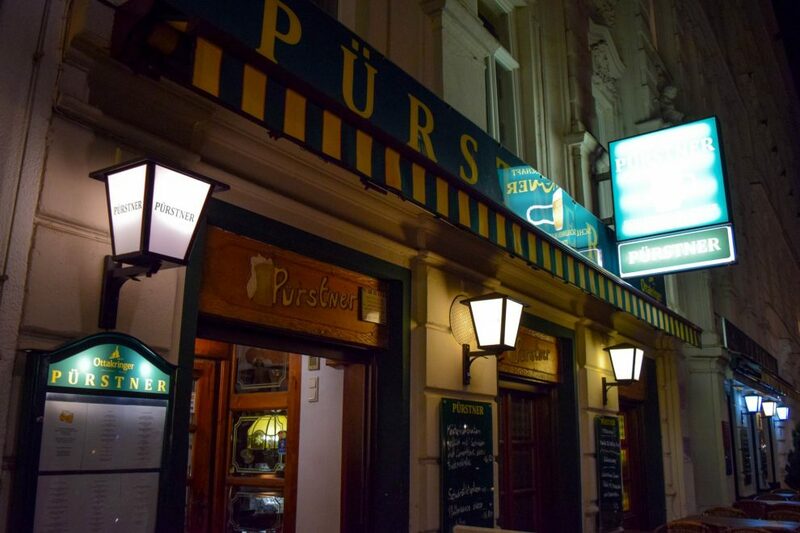 One thing to be aware of is that, as a western tourist, you might get treated a bit like a celebrity. This was no more apparent than in Kayanwala when we visited a local lady to have lunch in her mud brick home. On the way to the house, we crossed a lake in a canoe where a family were having their daily bath. In between shampoos, they stopped to wave at us and looked like they had just met the Queen when we all waved back. The little things, eh? At the house, the lady gave us a quick demonstration of how she cooked our feast of 10 dishes on one tiny stove. It was very impressive, and really made us think about whether we really need all our cooking utensils and dishwasher. But, yes we do! The food was all absolutely fantastic – we had curry, dahl, fried fish, pickles, rice, fresh fruit and a weird vinegary curd yoghurt with sickly sweet syrup. It’s all the rage out in Sri Lanka, and I was the only one in the group that actually liked it! 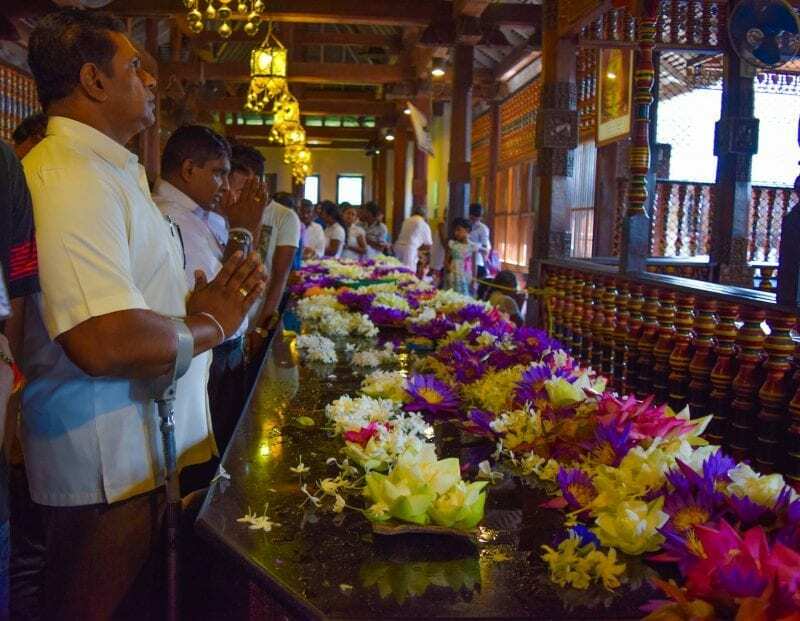 Kandy is yet another UNESCO World Heritage Site – it seems Sri Lanka is full of them! The city is the second largest in the country, and is set around a central lake that makes it a really beautiful place to visit. It is home to the Temple of the Tooth, which is said to contain one of Buddha’s teeth – only you can’t see it as it’s hidden in seven golden caskets to protect it. While we were visiting the temple, we watched some Buddhist rituals including offering food to the monks and traditional drumming in front of the temple’s inner chamber. We saw the same kind of drumming again at a show of Sri Lankan music and dance later that night. There were 20 or so performers including drummers, plate spinners, dancers, acrobats and fire walkers, all wearing traditional costumes. 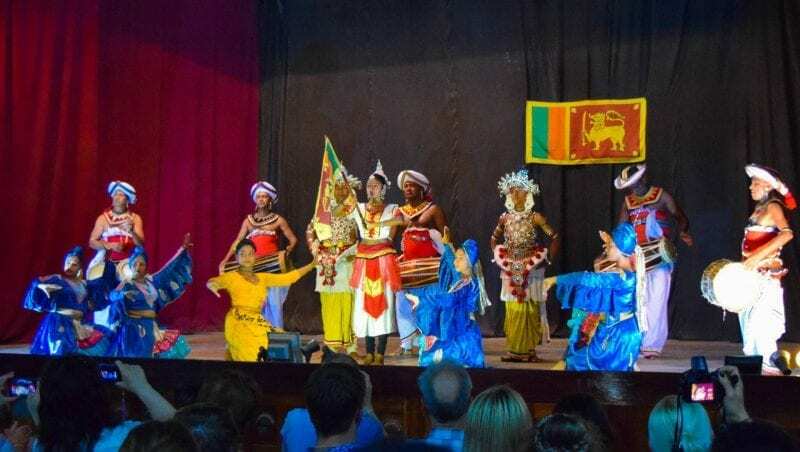 It was really good to see, and certainly gave us an insight into the more cultural side of Sri Lanka. 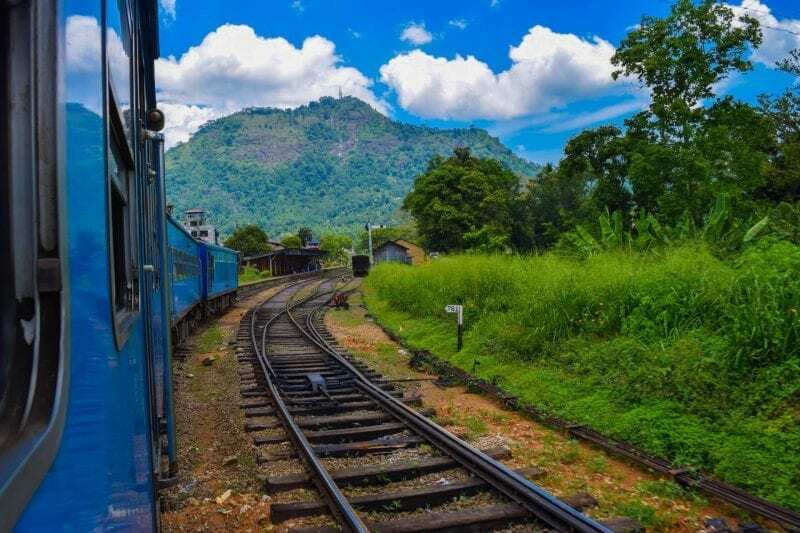 No visit to Sri Lanka is complete without a journey on the railway, and we were lucky enough to spend four hours staring out at the most spectacular scenery from our 2nd class train cabin. As the train climbed higher into the mountains, we saw beautiful waterfalls, tea pickers collecting tea leaves in the plantations and passengers hanging out of the doors at the back of the train. It was such a great experience. There’s obviously quite a lot of English influence in Sri Lanka, thanks to its British rule dating back to the 1800s. 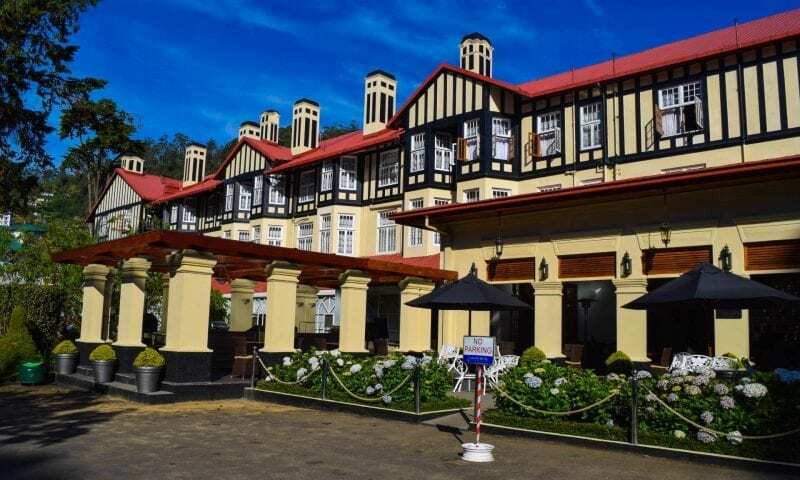 The influence is really obvious in Nuwara Eliya – a town high up in the Sri Lankan hills that was founded by a British man in 1846. Because of its cooler climate, it was perfect for British colonialists who wanted somewhere to play cricket, drink tea and ride horses. Nowadays, it has retained most of its British architecture, including the Grand Hotel where we were lucky enough to stay the night. There’s not much to the town itself except for a tudor style Post Office and green Victoria Park. 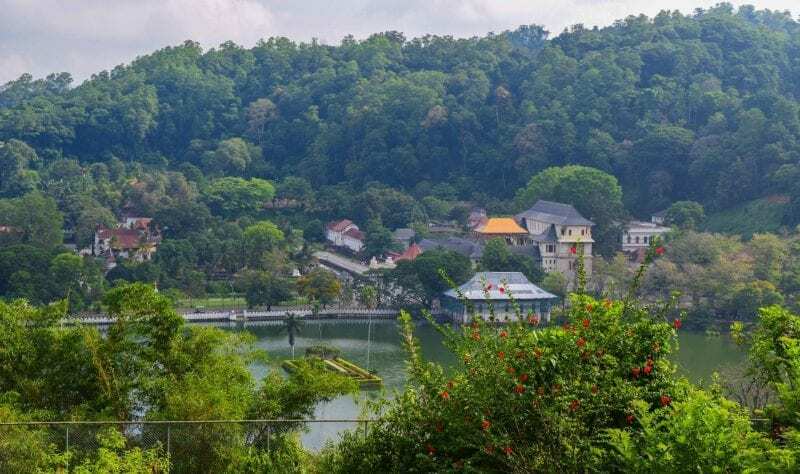 We used the town as a base to explore the surrounding areas, full of tea plantations and a beautiful waterfall in nearby Ella Gap. Drivers in Sri Lanka are nutters. 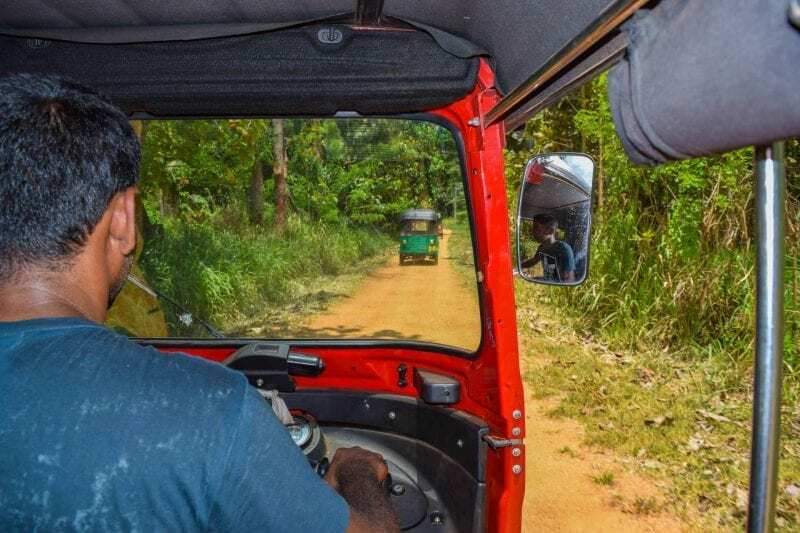 No matter whether we were travelling in a tuk tuk or on our own tour bus, we were always a bit surprised to get to our destination without crashing. Cars overtake each other in front of oncoming traffic, and their horns are used far more often than their brakes. I was woken up from car naps so many times when our driver broke too hard or beeped the car in front to get them to move over. Despite all this, road rage was really uncommon and we always stayed in one piece. 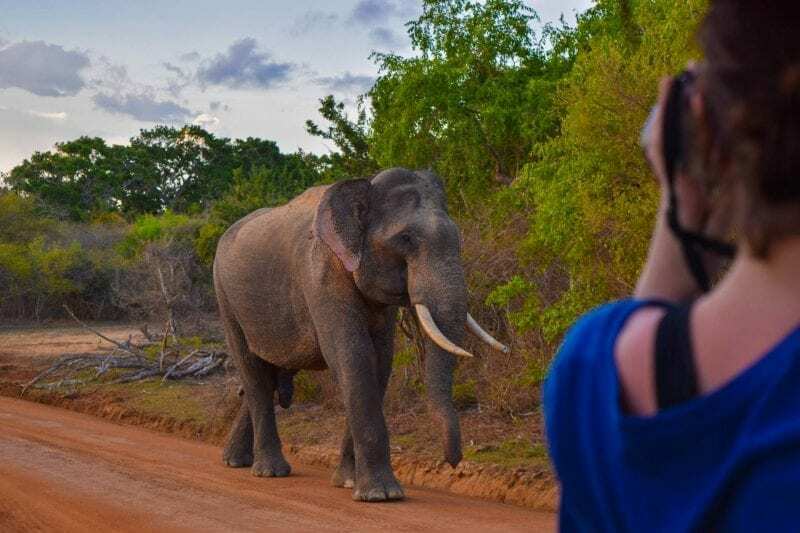 This might surprise you, but Sri Lanka has wildlife and safari opportunities to rival Africa. Seriously. Ignoring the Elephant Orphanage, which is more theme park than sanctuary (more about that here), wildlife is very well cared for in Sri Lanka. National Parks are staffed by conservation experts, and other than the safari jeeps that cart eager wildlife spotters around, the animals are allowed to roam completely free. While on game drives in no less than three National Parks, we saw elephants, monkeys, crocodiles, water buffalo, wild boar, jackals, hundreds of birds, tortoises, deer, iguanas and mongooses. In Yala National Park, we were also lucky enough to see an illusive leopard leap up and down from a tree – amazing. Don’t panic all you beach lovers out there – Sri Lanka will definitely keep you happy too. As an island in the Indian Ocean, it has some of the most beautiful coastline in the world. Our hotel in Yala was right on the beach with views you just can’t help but stare at. Mirissa is a small coastal town that has grown in popularity recently, thanks to it offer of watersports and other activities. 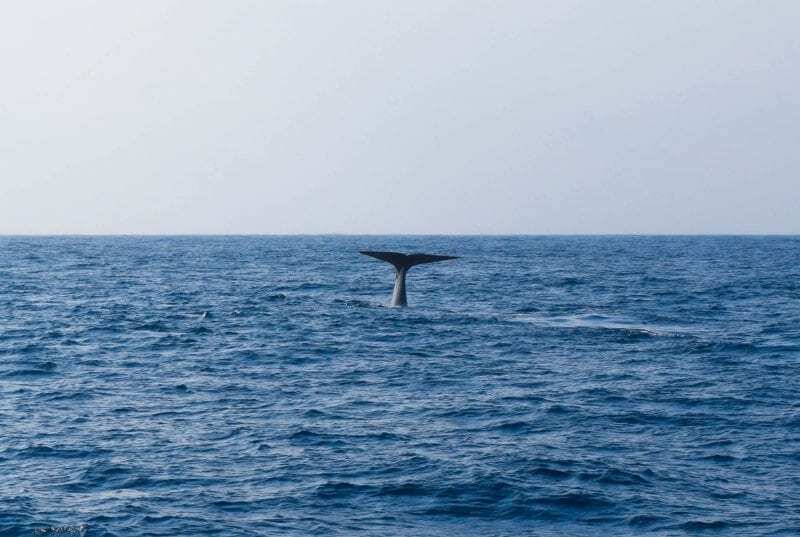 Did you know that Sri Lanka is one of the best places in the world to see blue whales? They migrate across the Indian Ocean between December and April, so we went at the perfect time to see them… and we did! We managed to spot a 25m long blue whale, complete with blowhole spurt and tail flip. Just incredible. When we returned to Colombo, we had a half day tour of the Sri Lankan capital before heading back to the UK. 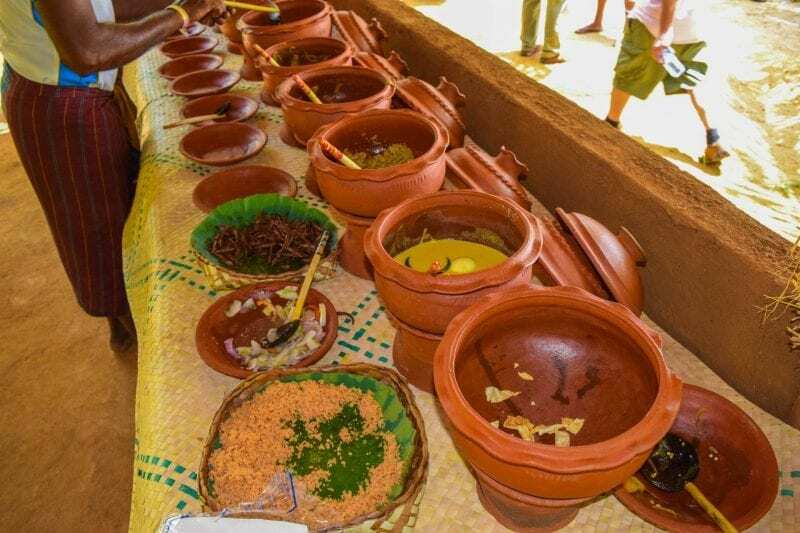 Most visitors use Colombo as a transit town to get to their real destination, but there are some treats to be had around town too. That said, our half day tour did seem to be enough for us! We visited the beautiful Gangaramaya Buddhist temple, full of Buddha images and vintage cars (random, huh? ), wandered around the Independence Memorial Hall and drove past the Town Hall – built in the style of the Capitol Building in Washington. I genuinely can’t recommend Sri Lanka enough. Go now to take advantage of its peace and beauty while you still can! Have you ever been to Sri Lanka or is it on your bucket list? What would you most like to see if you went? Sounds amazing! I spent just 4 days in SL a couple of years back – and LOVED it. Need to go again when I go to India sometime! Wow, Aparna! 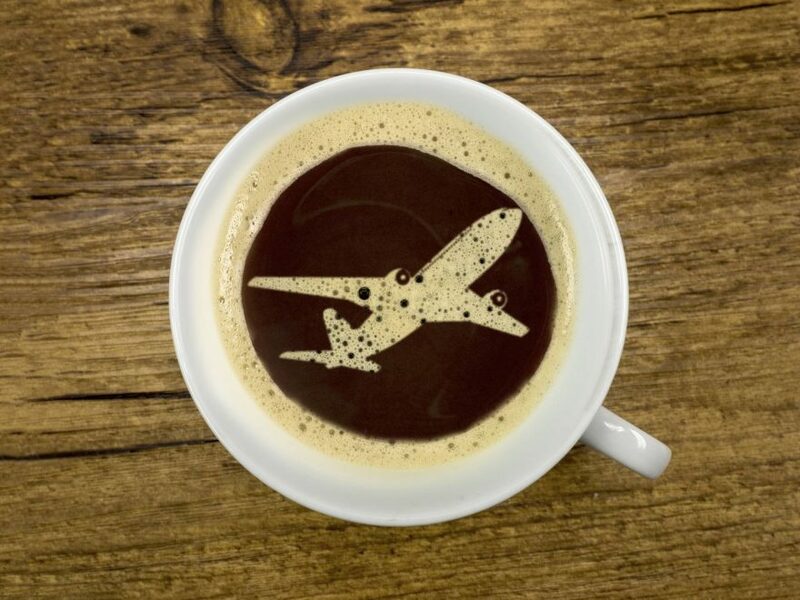 What did you manage to visit in 4 days?! It’s definitely worth exploring more next time you’re in the area! Looks incredible Anna, you’ve really inspired us to explore all the areas you’ve mentioned!